However, there are always lots of other considerations to think of such as healthcare issues, cultural differences, ease of gaining residency and also personal preferences in terms of heading to a particular country because of long standing family ties, friendships or even just the love of a particular country having spent many occasions visiting it previously on holiday. Below is a list of some of the most popular countries that Britons are choosing to retire to at present. The list is based upon the key issues surrounding things like tax, property costs, ease of obtaining residency, climate, culture and healthcare. You’d likely be able to guess a few of these destinations already but others you might find somewhat surprising. Cyprus is only a 4 and a half hour flight away from the UK and, it’s already a popular UK tourist destination because of its hot summers and relatively mild winters. It’s popular with retirees for a number of reasons. Firstly, they receive a preferential 5% tax rate in their pensions and English is widely spoken as well and you even drive on the same side of the road. Cyprus also abolished inheritance tax back in 2000. However, to gain full advantage of the Cypriot tax system, it’s necessary to sever all assets with the UK so you might find you need to move these offshore and then bring the income into Cyprus. As a member of the EU, you do not need a permit to retire in Cyprus and property costs are very reasonable - still below those of France and Spain. Pensioners are entitled to use the Cypriot healthcare system now that it is part of the EU, although there are not too many provisions for residential nursing homes so that might be something to consider for later on in life. If you like your climate to be hot all year round, Panama can boast of a balmy 30 degrees Celsius, 12 months of the year. English is also widely spoken. It has a low cost of living and a very low crime rate and pensioners also receive discounts on services such as travel, healthcare and leisure facilities. Income from any assets you bring in from outside of Panama are completely tax free. Property in Panama does not come particularly cheap although you can receive perks if you decide to rent out property there. Once you have bought property, you can apply for permanent residency after a year. Under its ‘pensionado’ system, pensioners can get between 10 and 20% off the cost of various medical treatments and surgical procedures. 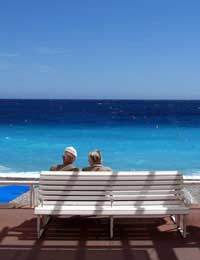 The overwhelming popularity of France as a retirement destination seems to be twofold. Firstly, its close proximity to the UK and ease of getting back to visit friends and family is important to many but what attracts most people to the country in their retirement years is the quality of life and the emphasis on good food and wine, at a remarkably reasonable price. Also, these days, many areas of France have a well-established English speaking community. Property is quite expensive however. As an EU member country, there is no problem in moving there and the taxation system is slightly more favourable than in the UK as long as you’re not in the highest taxation bracket which is less favourable. You are able to access free basic healthcare as long as you have the European health insurance card. However, any expat who is not officially retired and is not working can now have their entitlement to French state healthcare taken away since the beginning of this year (2008), if they have not lived in the country for at least 5 years previously which is forcing more expats to have to take out private medical insurance which can be extortionately expensive or come back to the UK. Other popular destinations for UK retirees these days include Spain, of course, but just like Panama, another quite far flung destination which has come onto the ‘radar’ over recent years is Belize. To date, it’s been far more popular with American retirees but Britons, too, have begun to show an increased interest over the past few years which is hardly surprising, given it’s a Commonwealth country where English is the official language and its tropical climate appeals to many. The cost of living is low compared to other Caribbean islands and residency for people aged 45 or over is a relatively straightforward process through the Belize government and those who qualify can take advantage of tax exemptions and incentives and are eligible for benefits. Furthermore, although Belize is still classed as a ‘third world’ country right now, it’s making remarkable progress and even has its own national tax-funded health service. Even private healthcare is relatively inexpensive compared to the UK and other EU countries. These are just some of the most popular places to retire for British citizens at present. The important thing when looking to retire anywhere overseas, however, is to ensure that you’ve done all your homework and left no stone unturned as to what to expect. Questionnaire: Can I Purchase a Holiday Home in Retirement? What Type of Retirement Home Would Suit Me Best? Questionnaire: Is Your Home Right for Retirement?